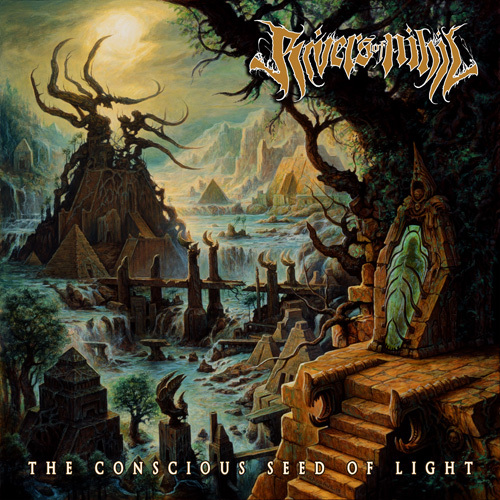 Pennsylvania’s Rivers of Nihil have completed work on their debut full length album, “The Conscious Seed of Light.” The album was recorded in March of 2013 at Mana Recording Studios in Florida with famed metal producer/musician Erik Rutan. Artwork for the band’s debut full-length was handled by famed cover artist, Dan Seagrave, whose portfolio includes covers for Morbid Angel, Entombed, Suffocation, and Decrepit Birth. RIVERS OF NIHIL ended up sending a brief treatment of the record that included a description of the album with song titles, a few lyrics, etc. to a number of artists the band admires. Every one of the artists seemed interested to a degree; however, it was Dan Seagrave who really seemed like he understood and appreciated what it was the band was going for. “The Conscious Seed of Light” will be released in North America on October 15th. New music, pre-orders, and video content will be released within the next few weeks. Updates will be made available at metalblade.com and on the band’s facebook page, facebook.com/riversofnihil. Born from the ruins of their decaying hometown of Reading, Pennsylvania, RIVERS OF NIHIL are on a relentless path of taking their music to the next level. Formed in 2009 the modern progressive death metal quintet’s music is as dark and heavy as the coal and iron their home city was built upon, taking influences from some of death metal’s heaviest, most abrasive hitters: Morbid Angel, Gojira, Spawn of Possession, and Decapitated, to name a few. This entry was posted in METAL and tagged ABIOTIC, ALLEGAEON, Brody Uttley, Chicago, Conscious Seed of Light, Dan Seagrave, Death metal, Decapitated, Decrepit Birth, Erik Rutan, Gojira, Mana Recording Studios, Melodi, Melodic death metal, Morbid Angel, Music, Pennsylvania, Progressive metal, Reading, San Antonio, Spawn of Possession, Tampa Florida, Technical Death Metal, transportation, Wretched. Bookmark the permalink.